While Google’s soon-to-be flagship Moto X has been confirmed, it hasn’t truly been officially announced just yet. 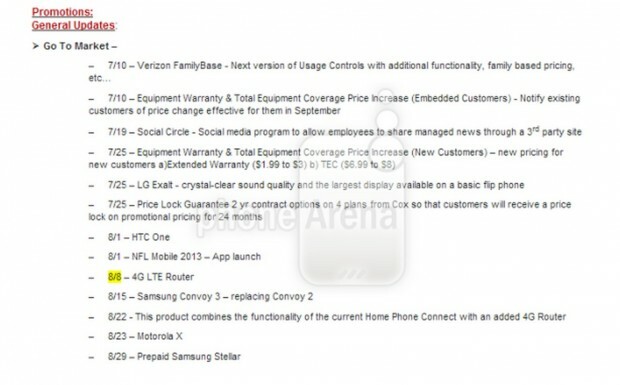 But if this leaked document for Verizon’s roadmap is right, we may have a release date for the device. The document says that the Moto X will be making its way to Verizon on August 23rd. Previous reports have noted that Google plans to make the Moto X available across all major US carriers, so unless any of the carriers have an exclusivity window on the device, we should expect the “first smartphone you can design yourself”  at around that time. Additional details in the roadmap corroborate previous reports of having the ability to choose colors for the back of the device and its trim, as well as an option to engrave the device. Retail versions of the Moto X will be a standard black model. If the phone’s release date is just a little over a month away, we should be hearing from Google about the Moto X very soon.